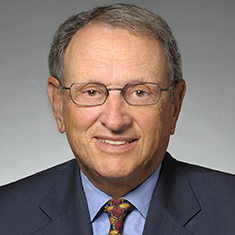 Allan Muchin is a Founding Partner of Katten Muchin Rosenman LLP. Having begun his legal career as a trial lawyer for the Internal Revenue Service, he focuses his practice on corporate and tax matters. Allan has served as a director or active advisor to the board of directors for many private and publicly held corporations including Alberto-Culver Company (1995-2005) and Columbia Acorn Investment Trust. As an owner and director of the Chicago White Sox and the Chicago Bulls, he maintains close affiliation with major sports franchises. Allan has spoken at national and regional conferences and associations for the Young Presidents Organization, the Chief Executives Forum and the Law Firm Compensation Institute and was the author of several articles. A long-term participant in numerous charitable and civic organizations, he has served as president and chairman of the Board of Directors of the Lyric Opera of Chicago and is presently the chairman of the Noble Network of Charter Schools. Allan has been honored by the American Jewish Committee, the Lyric Opera of Chicago and the Association of Fundraising Professionals. Shown below is a selection of Allan’s engagements.